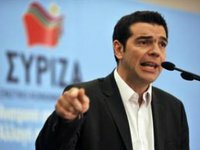 Prime Minister of Greece Alexis Tsipras has said that his country supports the resolution of the situation in Donbas through diplomatic means. "We discussed the issue of settling the situation in Ukraine's east. Unfortunately, we currently witness a certain escalation," he said at a press conference after the talks with the president of Ukraine in Kyiv on Thursday. According to Tsipras, there are ethnic Greeks in Ukraine's east, therefore the achievement of peace in the region is of particular importance for his country. "It is important that the ways to resolve the situation in the east should be found, and we believe that the best way is a diplomatic one. We support and have always supported the territorial integrity of Ukraine, the rule of law and the need to find ways to resolve these issues in compliance with international law," the Greek prime minister said. He also said Greece advocated the full implementation of the Minsk agreements to resolve the situation.